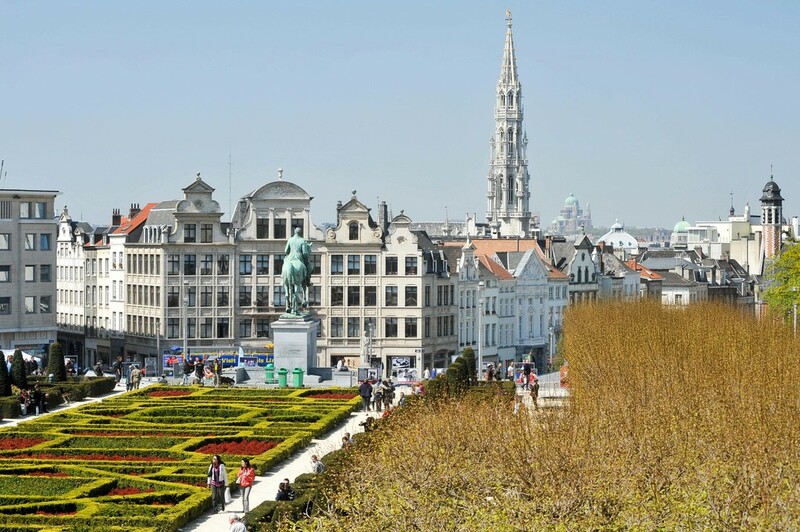 Brussels gets a boring Eurocrat rep, but dig a little deeper and you’ll find an urban playground of medieval architecture, surreal public art and lovely green spots. 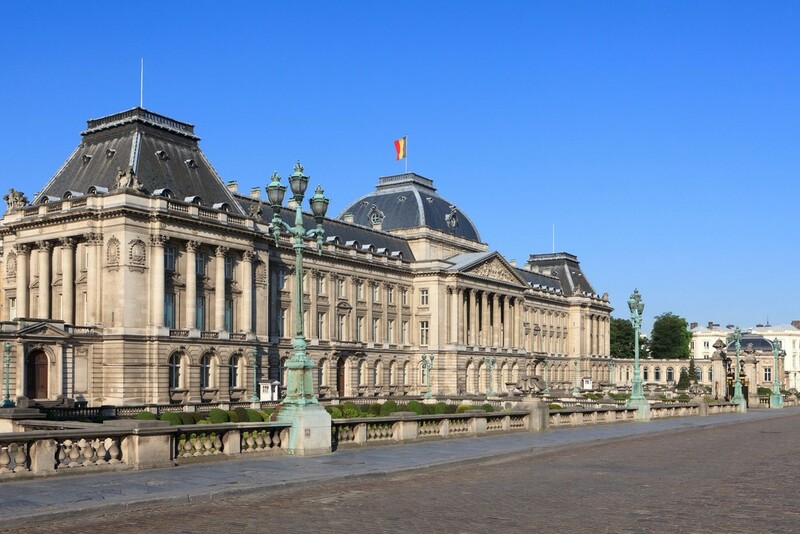 Explore the best of Belgium’s capital with this perfectly planned walking guide. You can begin your walk in a quintessential Brussels neighbourhood to immediately lose yourself in its biggest draw. 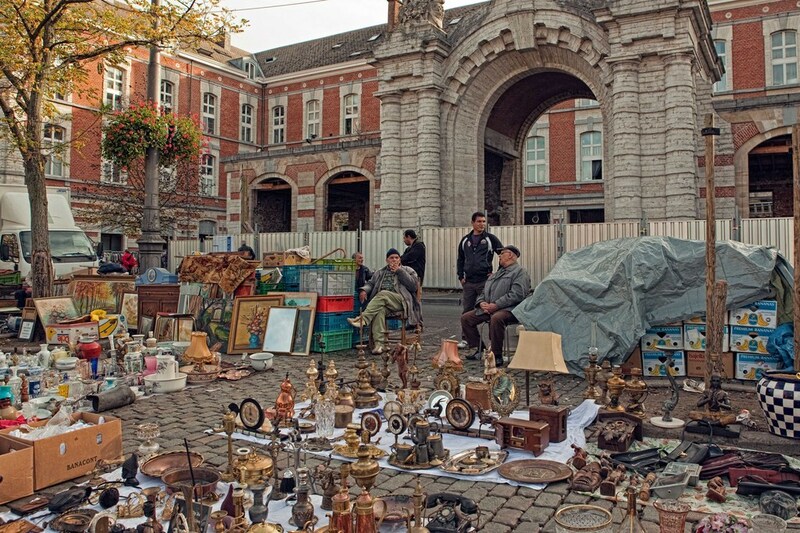 Every day from 6am onwards, the Place du Jeu de Balle flea market in the heart of the Marolles livens up the old, poorer district with vendor shouts and haggling bouts. Hit the cobblestones early to uncover the occasional treasure amid the tower-high bric-a-brac piles, or settle on one of the many terraces around to watch the locals in action. Walking southward over the Rue Blaes, known for its vintage and antique shops, the environment soon evolves from scruffy charm to a more tailored appeal. At the heart of the upscale Sablon neighbourhood lie the Grand Sablon and Petit Sablon squares, neatly divided by the 15th-century Église Notre-Dame. While the big square boasts quality antiquarians and chocolatiers, the smaller version makes for an especially lovely garden spot to enjoy a beautiful day in the city. 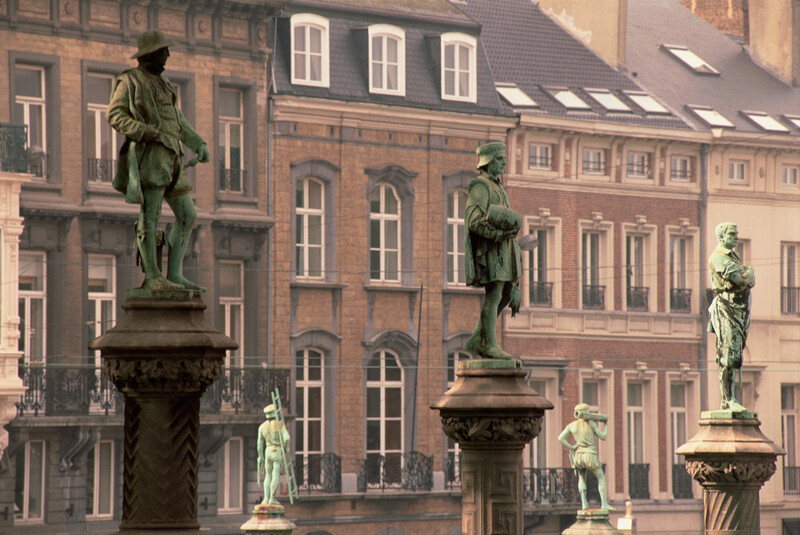 Thanks to 48 bronze statuettes depicting ancient Brussels professions, bench-sitters are effectively surrounded by local history. 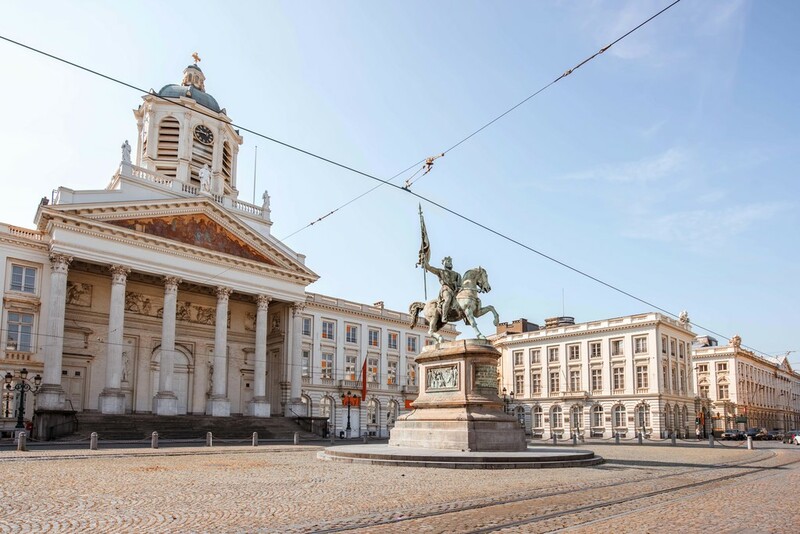 From the Petit Sablon, it’s a straight shot to the Place Royale, the spacious plaza standing atop the ruins of the Coudenberg Palace, an ancient seat of power in the region. Among the cream-coloured neoclassical buildings are some of the country’s most beloved museums (the Magritte Museum, the Royal Museums of Fine Arts), and a bit farther, you’ll find the stunning Art Nouveau Musical Instruments Museum and Art Deco precursor Bozar. In summer, be sure to continue to the Royal Palace for a free glimpse at the monarch’s beetle ceiling. At the request of Queen Mother Paola, acclaimed conceptual artist Jan Fabre plastered the ceiling and chandelier of the palace’s sumptuous Hall of Mirrors with 1.6 million scarab shields. The intriguing mosaic is titled Heaven of Delight, though Fabre claims to have hidden skull figures in the work as a reference to Belgium’s not too gentle colonial past in the Congo. From shiny jewel beetles to the most photographed view in Brussels. The stairs looking down on the Mont des Arts garden provide a panoramic sight of René Pechère’s geometric gardens and the medieval city core below. If you’re feeling peckish, grab a sandwich made with love by the one and only Tonton of Tonton Garby’s acclaimed cheese shop. 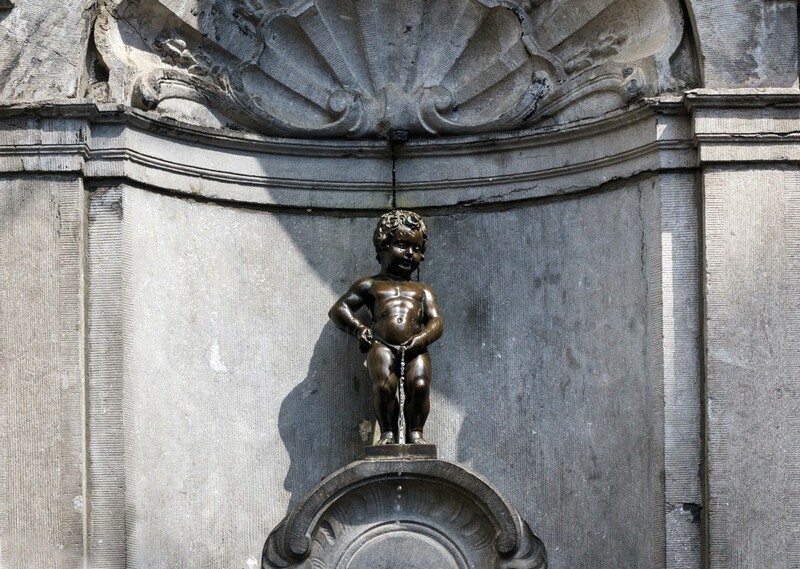 Typical of Belgian humour, Brussels’s pride and joy is a small statue of a rebellious boy peeing into a water fountain. 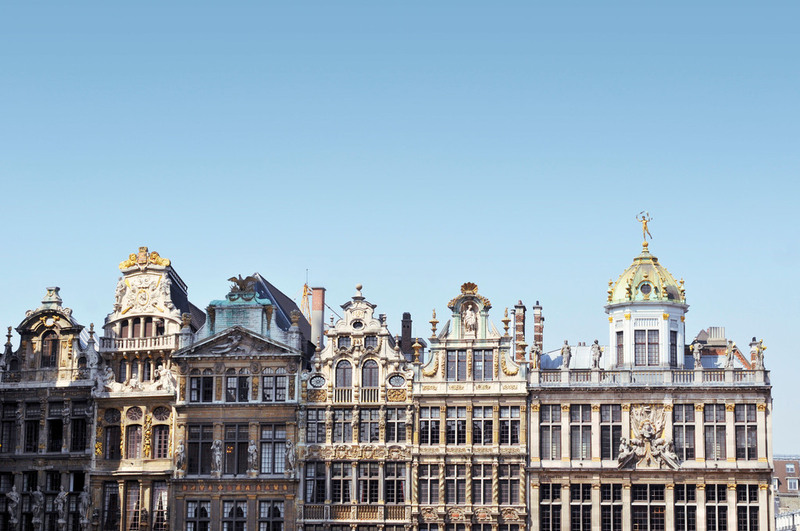 Spotting Manneken Pis – who’ll hopefully be sporting one of his hundreds of entertaining outfits – means you’ve entered the Îlot Sacré or ‘Holy Island’, the neighbourhood with the most historic and touristy streets of Brussels. Walk three minutes from Manneken Pis to a noontime drink at Moeder Lambic. The revered Brussels establishment distinguishes itself through its knowledgeable staff and eye for craft. 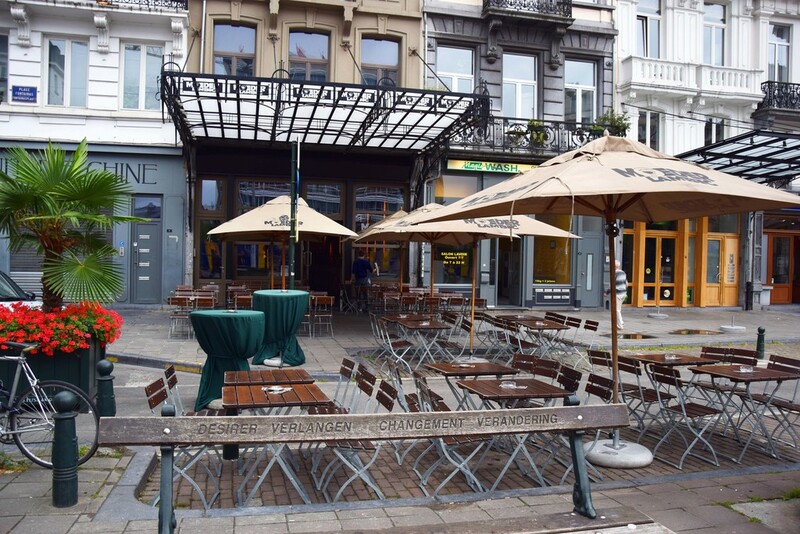 Despite its connoisseur status, the mother of all beer bars is always welcoming to international beer novices in need of an introduction to the wonderful, dizzyingly expansive world of Belgian brews. Opt for lambic and gueuze if you want to go hyper local and don’t mind a tart taste. In the Îlot Sacré, all cobbled alleys eventually lead to the Grand-Place. Widely considered a magnificent display of medieval architecture and urban grandeur, the city’s main market has managed to preserve a remarkably homogeneous look that prompted Victor Hugo to describe it as “a miracle”. Especially eye-catching upon entering the closed-off square for the first time are the 15th-century town hall and the King’s House, home to the City Museum. From the Grand-Place, it’s a hop, skip and a jump to another beloved Hugo hangout: the Galeries Royales de Saint-Hubert and its Taverne du Passage (known as the Café des Arts when Hugo drank and conversed here). The fanciful glazed shopping arcade conjures up visions of 19th-century flaneurs, artists, intellectuals, and Brussels’s most stylish, who flocked to the remarkable construction in masses upon its opening in 1847. 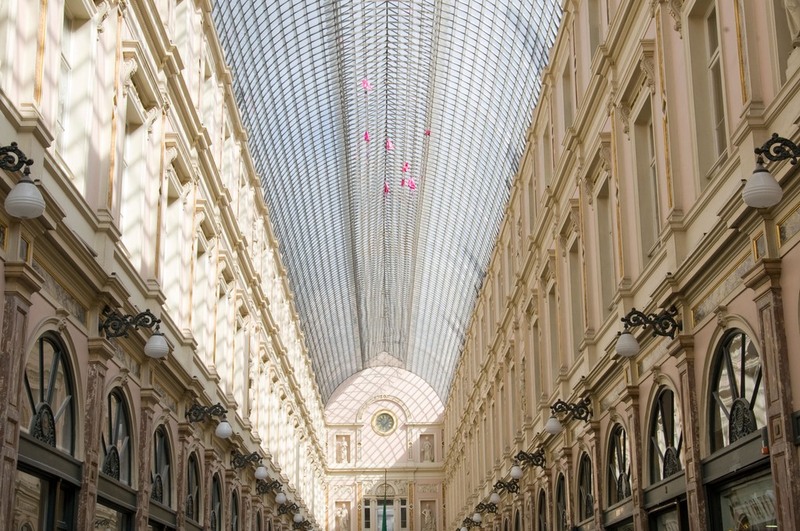 The galeries was one of the first of its kind in Europe, inspired by young architect Jean-Pierre Cluysenaar’s fondness for the Italian Renaissance. Exiting on the Rue de l’Ecuyer, a slightly surreal statue of a colourful biking cat in cycling shorts (rumoured to have cost the city a whopping €100,000) will greet you. Images of La Bourse went around the world after the terrorist attacks of 22 March 2016. 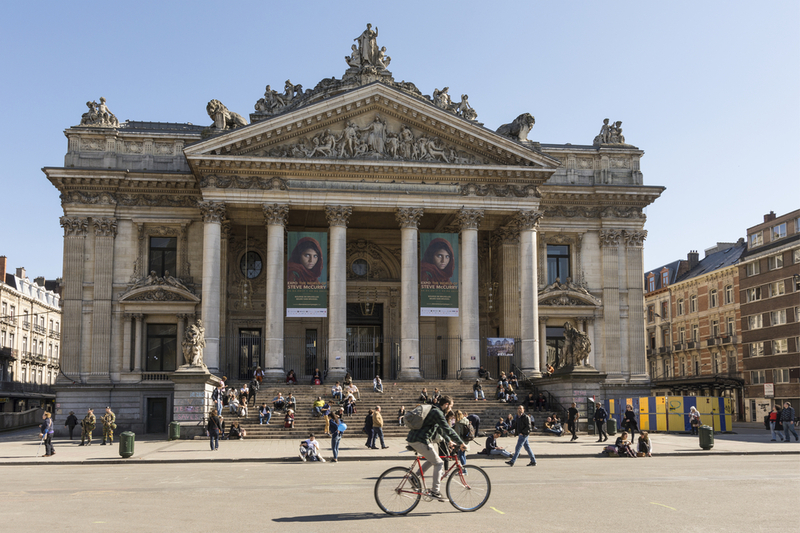 The square around the imposing building – a former stock exchange slated to become the ultimate Belgian beer museum in 2018 – was where locals and visitors flocked to show unity and solidarity. By the afternoon, the plaza had filled up with people holding hands, chalking messages of peace on the ground, and leaving candles, flags and flowers to remember the victims. The neoclassical embellishments on the building’s façade are partly from the hand of French sculptor Auguste Rodin. Chances are you’ve already spotted many of them on your walk, but when you settle on La Bourse’s steps with your packet of crispy golden sticks from Fritland, you’ll be glad you’ve held out for the right friterie (fast-food restaurant). Fries are a huge source of pride and comfort to Belgians, and Fritland, with its plethora of national flags, has been a staple of Brussels food culture for almost four decades. The usual line out the door moves fast and contains quite a lot of locals, so you know they’re doing something right. When in the mood for a madcap speciality, try the mitraillette, a sandwich jam-packed with fries, meat, veggies and a sauce of your choosing.